Hyde Park is one of the premier retirement communities in Florida and is advantageously located just outside of Orlando, FL. Our community, which is restricted to adults ages 55 and older*, is designed to facilitate the lifestyle goals of retired men and woman who want to stay active and stretch their savings to the fullest in a friendly residential setting. In truth, Hyde Park isn’t just a place to live … it’s a lifestyle. Unlike some Florida retirement communities, Hyde Park offers affordably priced housing together with a wealth of resort-style amenities that give each resident the opportunity to lead an active, fun-filled lifestyles in the company of others who wish to do the same. 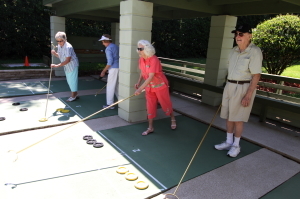 Plus, at Hyde Park, our residents frequently participate in a wide range of structured activities. Seven days a week, there is just about always some kind of activity for the residents of our 55 and over community to engage in. Popular activities include card games, Bingo, needle club, quilting, arts and crafts, Bible study, and group excursions to the Winter Garden Downtown Historic District – a place with lots of “Old Florida” charm. For more information, contact Hyde Park, one of the best retirement communities in Florida and a wonderful place to call home. We are located on W. Colonial Dr. just a few miles west of downtown Orlando, FL.